Place the two cups water in a pot add a pinch of baking soda to the water and add 3 family sized tea bags. Bring to boil, remove from heat and cover. Allow to sit for at least 10-15 minutes. Add the sugar to the hot tea and stir until the sugar is dissolved. Then fill remaining pitcher with cold water. The soda takes out the bitterness and darkens the tea....this small amount doesn't change the taste. We southerners do like our sweet tea. I've never heard of putting the soda in it before. Welcome to A~Z FOODS on Monday..
as a Southerner,making tea was an art..
cover and remove from the heat! adding enough cold water to fill. pour yourself a glass and enjoy! Loui, I tried adding sugar to boiling water and it changed the taste of the tea..or so DH said. Made it to candy like..men. 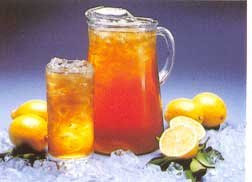 We like sweet tea, but not syrupy tea, DH's Mom always used 1 1/2-2 cups sugar per gal. was always thirsty after drinking her tea...I have cut ours to 1/2 -1 cup. One of my best friends growing up had a mother from North Carolina. She made the best iced tea in the world. I will never forget it, or be able to duplicate it. Thanks for the recipe. Now maybe I can! Molly - I had never heard of baking soda either. And I am a southerner (by living in the south), but have to admit I like my tea without sugar! Looks like you do it right! Obviously we were about on the same wavelength this week. Man, I am still learning new things about iced tea!! Never knew about the baking soda trick. Happy A-Z Monday and welcome to the group!